Jennifer Donnelly is the author of three adult novels, The Tea Rose, The Winter Rose, and The Wild Rose, as well as the young adult novel A Northern Light, winner of Britain’s prestigious Carnegie Medal, the L.A. Times Book Prize for Young Adult Literature, and a Michael L. Printz Honor Award. She lives and writes full-time in upstate New York. You can visit her at www.jenniferdonnelly.com. [STAR] "Andi Alpers’s younger brother died two years ago and his death has torn her family apart. She’s on antidepressants and is about to flunk out of her prep school. Her mother spends all day painting portraits of her lost son and her father has all but disappeared, focusing on his Nobel Prize-winning genetics work. He reappears suddenly at the beginning of winter break to institutionalize his wife and whisk Andi off to Paris with him. There he will be conducting genetic tests on a heart rumored to belong to the last dauphin of France. He hopes that Andi will be able to put in some serious work on her senior thesis regarding mysterious 18th-century guitarist Amadé Malherbeau. In Paris, Andi finds a lost diary of Alexandrine Paradis, companion to the dauphin, and meets Virgil, a hot Tunisian-French world-beat hip-hop artist. Donnelly’s story of Andi’s present life with her intriguing research and growing connection to Virgil overshadowed by depression is layered with Alexandrine’s quest, first to advance herself and later to somehow save the prince from the terrors of the French Revolution. While teens may search in vain for the music of the apparently fictional Malherbeau, many will have their interest piqued by the connections Donnelly makes between classical musicians and modern artists from Led Zeppelin to Radiohead. 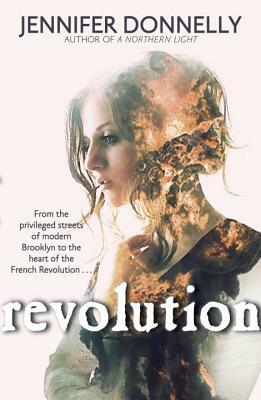 Revolution is a sumptuous feast of a novel, rich in mood, character, and emotion. With multiple hooks, it should appeal to a wide range of readers."